In the Timbuktu region south of the Sahara in Mali, patches of ground have been smoking for more than a century. Plumes of water vapor and carbon dioxide escape from red-hot holes and fissures in the ground. In April 2001, the inferno below the surface began to radiate outwards, scorching tree roots and leaving a trail of burnt soils and fallen trees. Over the following 10 months, the subsurface fires consumed more than 500 acres of richly vegetated land. 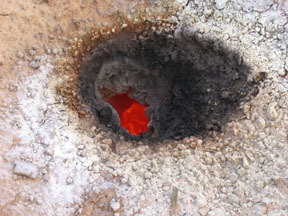 A subsurface fire in Mali ejects gases out of a fumarole. Photo courtesy of Henrik Svensen and Volcanic Basin Petroleum Research. Theodore Monod, a French humanist and scholar, first characterized the smoking holes, or fumaroles, in 1961. He concluded they were signs that the region had become volcanically active. Magma bubbling up from depth fueled the fumaroles. With this explanation in mind, local officials feared that the recent increase in activity foretold a disastrous volcanic eruption. The Ministry of Mines, Energy and Water in Mali asked a group of Norwegian geologists who specialize in volcanic basins to visit the sites and assess the hazard. According to their report in the August Geology, in just four days, the geologists collected the data they needed to overturn the long held belief in active volcanism  and substantially reduce the calculated risk for the region. The authors found that the spontaneous combustion of buried peat layers, not magma, caused the subsurface fires. In his original survey of the Lac Faguibine region, about 50 miles west of Timbuktu, Monod found dikes mixed in with the soils around the fumaroles. He suggested the dikes were basaltic and hosted the mineral nepheline, which could only have come from magma. In the early-1990s, French geologists built a geologic model of the region that supported the volcanism hypothesis by indicating that a huge and dense mass, likely magma, sat just 2 kilometers beneath the surface. They argued that a major east-west trending lineament had recently reactivated, and that the energy from the pull-apart tectonics drove the magma intrusion. Later, in 2000, a group of geologists from Sonatrach, an Algerian oil company, surveyed the region and past research and concluded that the fumaroles did indeed result from volcanism  fueling local concerns of imminent disaster. When the Norwegian team arrived in Mali, they expected to find signs of volcanism. Digging a 2.5-meter-deep trench at Haribibi, one of the sites with fissures and escaping smoke, they found a thin layer of peat burning just 60 centimeters below the surface. The temperature in the peat layer exceeded 800 degrees Celsius, but dropped down to cool background levels just 70 centimeters further down. "Then we had two possibilities," says Henrik Svensen, a geologist at the University of Oslo, Norw and lead author of the Geology paper: "the burning peat layer was the only source of the heat anomalies, or the peat layer could have been ignited by, let's say, magma at 1,000 degrees Celsius. In the latter case, magma would have to be present 1 to 1.5 meters below the surface." But they found no signs of magma. The group concluded that microbial decomposition of organic matter in the peat had likely generated enough heat to set the peat on fire. The impacted sites sit in a dried-out lake basin; the old sediments provide the rich organic material needed to stimulate high rates of microbial decomposition. "Burning peat is a relatively common phenomenon," Svensen says. Subsurface peat fires burn in parts of Botswana, and surface peat fires occur frequently in the United States and South Africa, he adds. During the rainy season, the Niger River occasionally rises enough to flood the Lac Faguibine region. Those floods have historically quelled the subsurface heat, which matches the pattern expected from peat fires, not magma intrusions, Svensen says. The volcanism hypothesis persisted for over 40 years largely because Monod was a legendary figure and a well-respected scientist, Svensen says. The minerals that Monod initially argued formed from magma intrusion could just have easily formed from the heating and melting of minerals in the burning peat, he adds. Glenn Stracher, a geologist at East Georgia College in Swainsboro, Ga., who studies subsurface coal fires, agrees. "People have not thought in the past about the amount of heat that can be generated by fire, whether peat or coal, which can create enough heat to generate what are, in essence, igneous rocks," Stracher says. The several thousand people living in villages and nomad camps in the Lac Faguibine region no longer face the prospect of a volcanic eruption, says co-author Dag Dysthe, a physicist at the University of Oslo. But the peat fires still pose health and environmental risks. By burning tree and grass roots, the fires increase the rate of desertification at the fringes of the Sahara, Dysthe says. Additionally, Svensen says, the fires are extremely difficult to put out, and the gases emanating from the fumaroles and fissures may contain hydrochloric acid and sulfur dioxide, both toxic.